A lot is happening all across IdeaGist network. This newsletter will cover some of the highlights. 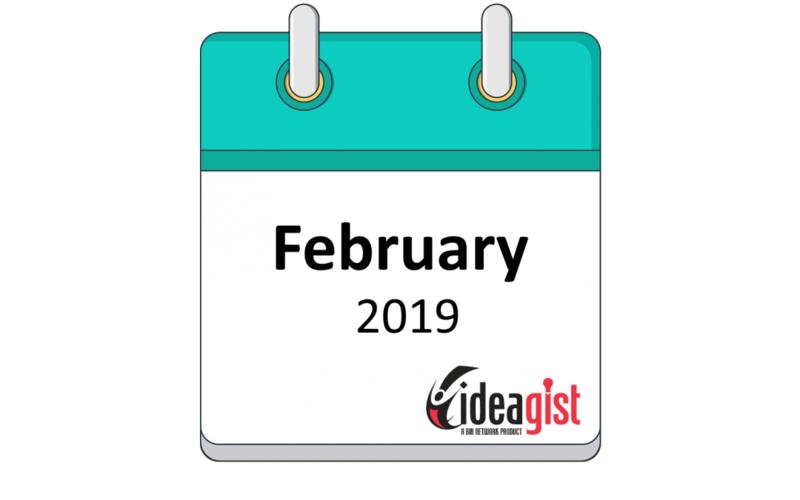 IdeaGist crossed 50,000 mark in December 2018, making 2018 fourth year in a row with 100%+ growth. We now have more than 52,000 entrepreneurs, innovators, investors, mentors, and other collaborators from all 193 UN recognized countries and two observer states. It was only possible with your support; Thank You! To celebrate this event, IdeaGist is offering a 50% discount on 5,000 Gist Points Package. These points will not expire and you will be able to use for all premium features and services. Click here to learn more. More than 3,500 people have trusted IdeaGist to work on their ideas in total privacy. We don’t take any ownership in your ideas or sell your data to third parties. Take the first step today and start working on an idea in your spare time. Log in to IdeaGist, click on Idea menu and select “Add Idea” to start. IdeaGist.com has signed a deal with Squiglit.com which will allow IdeaGist users to claim 12 months free membership, a $60 value. In return, IdeaGist will offer free idea incubation to Squigl users. With Squigl, anyone can make an animated video using simple text. Under this deal, IdeaGst users will simply be able to log in using their IdeaGist ID and use Squigl for 12 months. Please login today to claim it. IdeaGist started Blockchain Incubator project last year, leading to the launch of the International Blockchain Incubator in January. We are proud to announce the advisory board for IBI. Click here to learn more. $500 in Qwiklabs credits to kickstart your company’s hands-on lab training initiatives. One year of free G Suite (up to 5 Users – only valid for new domains), or a year of discounted upgrades to G Suite Business or G Suite Enterprise. An opportunity to apply to our Spark program to extend your credits to up to $20,000 for a second year as your business continues to grow.